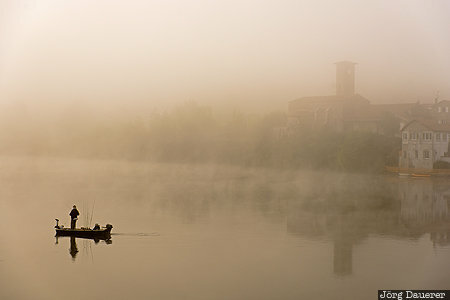 The misty Lot river with a small fishing boat in the foreground and the silhouette of Saint-Sylvestre-sur-Lot in the background before sunrise. Saint-Sylvestre-sur-Lot is in the region Aquitaine in central France. This photo was taken in the morning of a sunny day in September of 2015. This photo is part of the exhibition Urban Fog (October 2018). This photo was taken with a digital camera.